Barnes and Noble has just introduced the second generation of Nook, its e-reader. 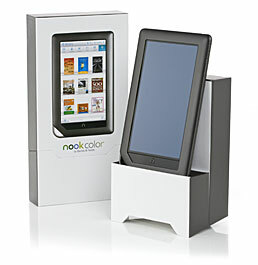 Now named NookColor, it is as you might have guessed a colored e-reader plus more! According to a statement of Barnes & Noble chief executive William Lynch, the NookColor combines "the functionality and convenience of a seven-inch portable wireless tablet with the reader centricity of a dedicated e-reader." The Nookcolor runs on Android OS and has built in support for social networking applications such as Facebook and Twitter. It has a 7-inch colored LCD capacitive touch screen that can display video. The tablet/e-reader also has 8GB of internal memory that can be expanded up to 32GB with a microSD card. It can also connect through wifi. The device will be available on November 19 with a tag price of US$249. That makes it cheaper than the low-end iPad by more than US$100 but almost twice as expensive than the Kindle. This led us to conclude that the NookColor will not go after the Amazon Kindle or even the Sony Reader. Instead, it has trained its sight on the leader of the pack, iPad.